This is one in a series of demurely brief interviews with participants in the Commonwealth Reading Series. Lisa Olstein read in the series two years ago, after receiving a 2006 Poetry Fellowship. But along with being a past fellow (and current wonderful poet), she’s also the associate director of Juniper Initiative for Literary Arts & Action, one of the co-sponsors of this year’s series. She took time from her duties at Juniper Initiative, the MFA Program for Poets and Writers at University of Massachusetts-Amherst, and the wild and infinitely variant universe of poem-making, to nano-interview with us. MCC: What’s new and exciting at Juniper Initiative these days? Lisa: We’re gearing up for this year’s annual literary festival (April 24 & 25) which will celebrate the Massachusetts Review’s 50th anniversary with two days of readings, performances, and a journal and book fair. Readers will include Yusef Komunyakaa, Marilyn Hacker, Christian Hawkey, Lucy Corin, Thomas Glave, and others. And, we’re happily processing applications for this June’s Juniper Summer Writing Institute, a weeklong program (one for adults, one for high school aged writers) of poetry, fiction, and memoir workshops, along with readings and craft sessions. Faculty and writers in residence include Mark Doty, James Tate, Lydia Davis, Dara Wier, Charles D’Ambrosio, Paul Lisicky, and other amazing writers. MCC: How do you balance your duties at Juniper and the MFA Program with your writing career? Lisa: Ideally: carefully, and with joy. Realistically: like an amateur circus performer juggling flaming hoops in a tiny car. . .
MCC: What are you working on these days, writing-wise? Lisa: Poems that, hopefully, will make up my third collection. My second book of poems, Lost Alphabet, will be out this June. MCC: What writer do you most admire but write nothing like? Lisa: Li Po (she says with conviction). MCC: Computer, longhand, or typewriter? Lisa: Longhand on random slips and scraps to jot down passing phrases, then computer for the real deal, such as it is. MCC: Do you secretly dream of being a) a pop icon, b) an algebra teacher, and/or c) a crime-solver/writer a la Jessica Fletcher? Lisa: d) dolphin trainer, of happy, cage-free, entirely fulfilled human- and trick-loving dolphins. MCC: How many revisions does your work typically go through? Lisa: Anywhere from none (a rare and delightful occurrence) to dozens. MCC: Do you ever revise your work on the spot during live readings? Lisa: I really try not to, but occasionally a word here or there. Though every muscle in his body urged him not to, Sanderson crept toward the tinted windows of the gray-green Caprice. tinted grey-green in the body. The next event in the series takes place Wednesday, February 25, 2009, 7 PM at Forbes Library in Northampton, featuring DM Gordon, Liz Hughey, Bill Peters, and Michael Teig. Event co-sponsored by Mass Humanities. Read about all of the events in the Commonwealth Reading Series. 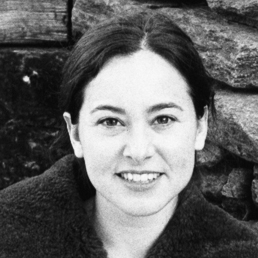 Lisa Olstein is the author of Radio Crackling, Radio Gone (Copper Canyon Press, 2006), which won the Hayden Carruth Award, and of Lost Alphabet (2009). A recipient of a Pushcart Prize, as well as fellowships from both the Massachusetts Cultural Council and the Centrum Foundation, Olstein has been widely published. She presently serves as associate director of the MFA program at the University of Massachusetts and is a cofounder of the Juniper Initiative for Literary Arts & Action. Read all of the nano-interviews.